This trip leg report contains a number of definitions of various aeronautical terms and abbreviations that will appear throughout the various reports later on. Most of these are in parentheses. I won't distract you by repeating them in subsequent leg reports. This was my first transoceanic leg. It would require a takeoff at a gross weight way above the normal maximum for my airplane. It was the only part of the entire adventure that genuinely worried me. Would the heavily overloaded Mooney get into the air and stay there, or would I become another aviation statistic in a ball of crunched aluminum off the runway at Oakland? I had planned everything in the utmost detail, talked to every expert that I could, and followed all the advice I'd been given. 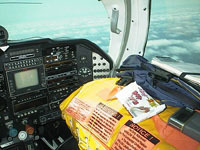 The aircraft had been signed off by the FAA as OK for this "ferry" flight at the high gross weight. Still, in 24 years of flying I'd never attempted a takeoff like this one! Both nervous and excited at the same time, I started up the Mooney and began my taxi for takeoff in Oakland after fog lifted at approximately 11:00 am. 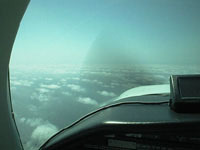 The temperature was 76 degrees F, the wind was a gentle 5 knots (nautical miles per hour) coming straight down the runway. As recommended by renowned ferry pilots Bill Cox and Fred Sorensen, as well as numerous others, I planned to delay lifting the airplane off the runway during the takeoff roll until it had developed more than the usual amount of speed. At these high weights, the pilot's operating handbook for the airplane becomes useless as a source of advice for proper liftoff speeds, since under these conditions I was, by definition, a test pilot! Summoning up all the courage I could muster, I informed Oakland tower that I was "ready to roll." I also warned them that after takeoff I would not be able to achieve a normal climb rate, so they could plan in advance for an amended departure route through San Francisco Bay. Very familiar with the frequent ferry pilot departures for Hawaii that leave this airport as often as weekly, the controllers were very accomodating. When the "cleared for takeoff!" instruction came, I held the toe brakes hard to freeze the airplane in place, gently applied full power, and carefully scanned all the engine guages. Satisfied that everything looked textbook perfect, I released the brakes and slowly started down the centerline of runway 29, Oakland's longest (10,000'). While the acceleration wasn't exactly impressive, it was better than I had expected. This long runway was well marked with distance signs, so I knew when the airplane refused to stay on the ground any longer as I passed the 3,000 feet marker that I had it made. Bill and Fred knew what they were talking about! The climbout was anemic, yes, but my proud steed actually flew! I remained in ground effect (flew close to the ground where the wing is more efficient) for as long as I could to build airspeed, raised the gear passing 90 KIAS (knots indicated airspeed), and cleared the far end of the runway at about 100 feet of altitude in stable flight. The Bay departure controller approved a flight path that could not comply with SID (i.e., normal) climb gradients, and instead vectored me over water and out of the mouth of the bay over the center of the Golden Gate bridge. I accelerated to 100 KIAS (which seemed to be the best rate-of-climb airspeed for this loading weight). Climb was 100-300 fpm (feet per minute) up to 6,000 feet, which was my assigned final altitude. The cruise speed wasn't as penalized by the extra weight as I had anticipated, and I only lost 5 - 10 knots. In fact, the recent addition of an HF radio antenna alone had already cost me 7 KTAS. That was as bad or worse than the effects of the added fuel. The combined effect of these factors was the reduction in my initial cruise speed from the Mooney's normal 153 KTAS to about 137 KTAS. The fuel burn rate was 11.7 gph (gallons per hour) at 75% power, which was for this trip the power setting I always used. Once the engine temperatures had stabilized in cruise, the fuel mixture had been leaned using a graphic engine monitor to ensure that the exhaust gas temperature on the leanest cylinder was 25 degrees F on the rich side of peak EGT. This provided a safety margin against possible combustion chamber "detonation," while at the same time ensuring efficient fuel utilization. The total block to block flight time to Hilo International airport was just over 14 hours. The flight was smooth almost all the way, but I did elect to climb to 8,000' for the last 300 miles when puffy cumulus clouds made the 6,000' altitude too bumpy. The HF (High Frequency, or shortwave) radio worked flawlessly all the way, as good as normal VHF (Very High Frequency radio) on the mainland! As an aside, my HF radio was equipped to cover most VHF frequencies as well, so it had FM receive-only capability in the standard FM broadcast band. I was able to get solid broadcast FM reception of San Fransisco area FM broadcast stations out to about 1,500 miles, then again I picked up the first Hawaiian stations at about 700 miles from Hawaii. Amazing! 6,000' wouldn't be high enough for line of sight that far, so I assumed that some kind of atmospheric ducting was going on. A friend of mine who's an Air Force meteorologist and a specialist in "space weather" (really an expert on the ionosphere) says that can happen, and it's not uncommon. I reached Hilo at 11:30pm local time. It was dark, and when I got out of the plane and stretched my legs for the first time in 14 hours, I couldn't find a soul anywhere. There wasn't anyone at the airport to let me out of the barbed wire security gate. I might have spent the night there, except for a lucky failing of VHF communications. I was instructed to cancel my IFR (Instrument Flight Rules) flight plan after landing on the ground on 126.6 MHz, a local remote communications outlet frequency at Hilo used by the controllers at Honolulu Air Route Traffic Control Center. As it turned out, they couldn't hear my cancellation, so I contacted San Francisco controllers on the HF from the ground and canceled with them. Now, how was I going to get my tired body into a hotel bed? I decided to just tie down and cover the airplane and worry about it then. No sooner had I secured everything when a policeman came by looking for the "lost aircraft." A friendly controller at Honolulu Center knew I'd just flown 14 hours and was worried that something might have happened to me on landing, so he launched Search and Rescue (a fairly common occurrence and not as big a deal as it sounds) immediately when he couldn't reach me on VHF instead of waiting the usual 30 minutes. That was good for me, as the cop was kind enough to both let me out of the chained gate and even to drive me personally to my hotel! I called the guy at Center and thanked him. As of 45 minutes post landing he still hadn't heard from the San Francisco HF radio operator. 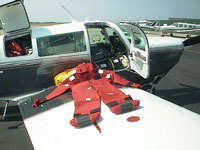 The thermal flotation suit and life raft ready for the take-off from Oakland, CA. I also carried two emergency radio beacons that would allow a satellite to pinpoint my position, even if I were simply floating in the Pacific in a life preserver. 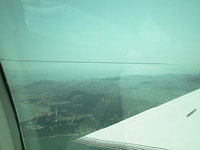 My last view of San Fransisco Bay as I flew westward. This picture also shows the long wire HF radio antenna that stretched from the tail to the left wing tip. 2,400 miles of seemingly endless, yet tranquil Pacific over the nose. Lunch (Poptarts) sitting on the life raft, which itself laid on top of a 35 gallon gas barrel. 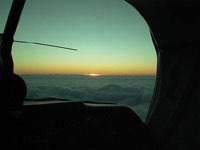 A Pacific sunset as seen from 6000 feet on top of an undercast.